Clearly, Ladbrokes – now the Ladbrokes Coral Group – has stood the test of time and, today, is one of the most recognisable and trusted bookmaking brands worldwide, on- or offline. The UK Competition and Markets Authority ruled that Ladbrokes and Coral must sell a combined total of 359 betting shops as a condition of the merger, but these were purchased by Betfred and Stan James for £55.5 million. Even so, Ladbrokes Coral Group plc is far and away the largest high street bookmaker in the UK, with over 1,000 more betting shops than its nearest rival, William Hill. Gambling software development company Playtech has backed the merger and increased its stake in Ladbrokes to 10%. The Ladbrokes betting business, as we know it today, was founded by philanthropist Cyril Stein and floated on the London Stock Exchange in 1967. At the time, Ladbrokes was worth £1 million, but when Mr. Stein left the company in 1994 the company was valued at around £2 billion. 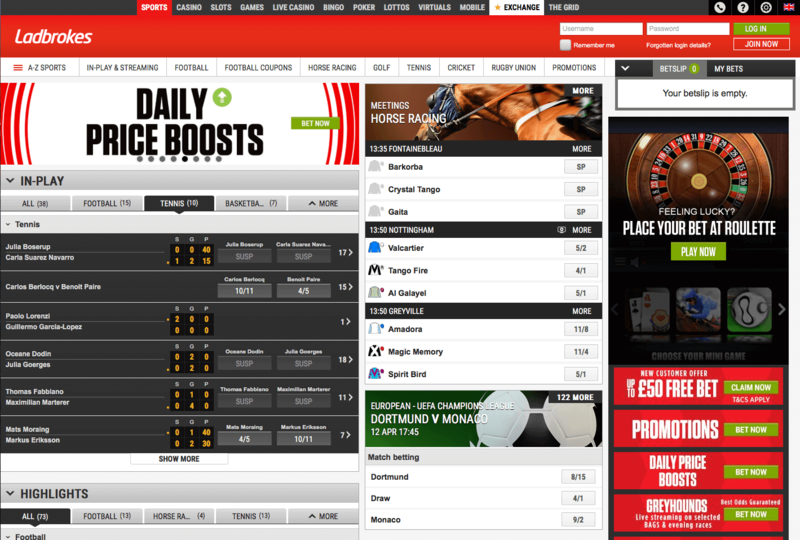 One of the original ‘Big Four’ bookmakers, Ladbrokes has continued to thrive, establishing an online presence in 2000. Ladbrokes finalised a £2.3 billion merger with rivals Coral in November 2016 and, in the year as a whole, revenue from Ladbrokes.com rose by 17%, despite unfavourable sporting results in the UK. The combined odds against Leicester City, Brexit and President Trump were apparently 4,503,905/1. Historically, Ladbrokes built its business on providing betting services, primarily on horse and greyhound racing, to generations of British customers. By focussing on the interests of its customers, the company has built a strong market reputation for itself, but continues to innovate, through extensive online betting coverage, promotions and overall customer experience. 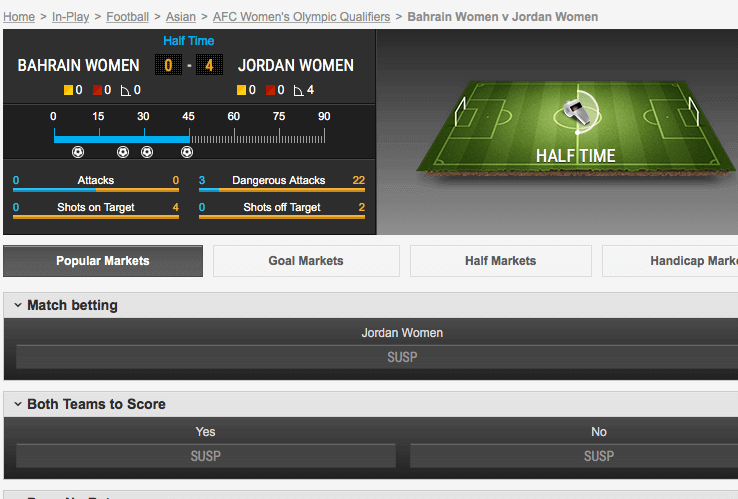 ‘Cash Out’ facility is available on selected ‘live’ or ‘in-play’ markets. Punters can have few complaints about the range of betting markets available from Ladbrokes. Horse racing coverage obviously includes the UK and Ireland, but also Europe, North America, Asia and Australia, while football coverage includes all the major European leagues, plus a few from further afield, such as the Japanese J League and the Australian Hyundai A-League. Indeed, the ‘A-Z Sports’ list includes everything from American football to volleyball, with enough markets to keep even the most avid sports fan happy. On the downside, the odds offered by Ladbrokes, even on traditional, ‘bread and butter’ markets, such as football and horse racing, really aren’t competitive when compared with other bookmakers. In many cases, the disparity isn’t huge but, over time, even fractions of a point can make a tremendous difference, especially in markets such as football, where doubles, trebles and accumulators are popular. 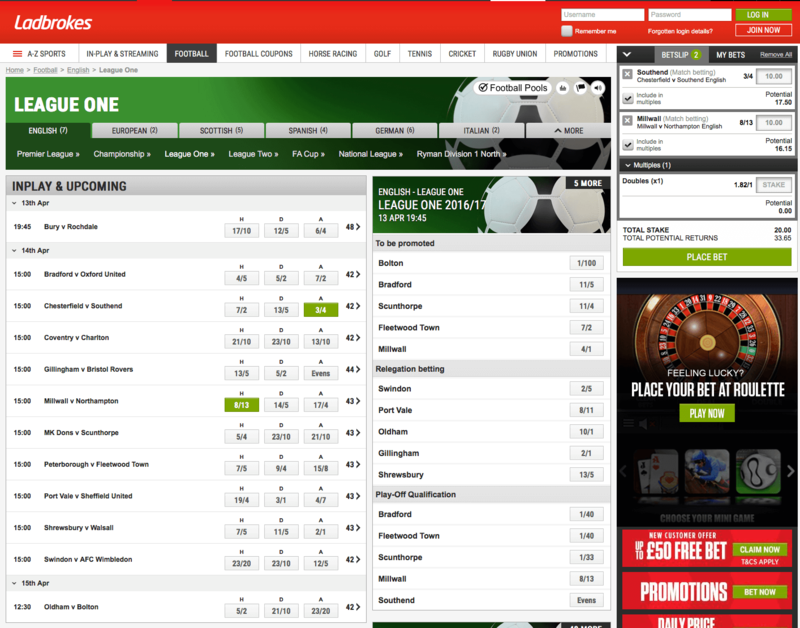 In smaller, ‘niche’ markets, the problem is worse still, with Ladbrokes falling well short of the competition. Arbitragers beware, too. Arbitrage involves taking advantage of different odds offered by different bookmakers to make a profit from a bet regardless of the outcome. Ladbrokes’ customer service staff may have weaknesses in other areas, but not so in spotting ‘arbing’ which, while perfectly legal, may result in your account being severely limited, or closed altogether. Historically, one criticism levelled at Ladbrokes was that, while its website and mobile apps were fine from a functional point of view, its betting software was slow and less user-friendly than that available elsewhere. Thankfully, that’s no longer the case; Ladbrokes has invested no little time and effort in improving its interface and the results are there for all to see. Whether you bet via the original website, the mobile version or the mobile application, you’ll instantly recognise Ladbrokes’ distinctive red-and-white livery and everything is laid out to make finding and placing the bet you want as quick and intuitive as possible. Ladbrokes’ mobile application is fully integrated and allows complete functionality from your smartphone. ‘Live’ or ‘In-play’ betting – that is, betting on an event, such as a football match, after it has started – is an area in which Ladbrokes excels. Ladbrokes offers an extensive range of traditional markets, alongside more creative ‘proposition’ bets, on football, cricket, golf, tennis, rugby and many smaller, ‘niche’ sports. Clicking on the ‘In-Play & Streaming’ tab reveals all the markets on which in-play betting is available, while clicking on the ‘Stream’ tab allows you to watch any of the events currently being streamed live on the site. To watch a live stream, you must be logged in and have a positive balance in your account, or have placed a bet with the last 24 hours. 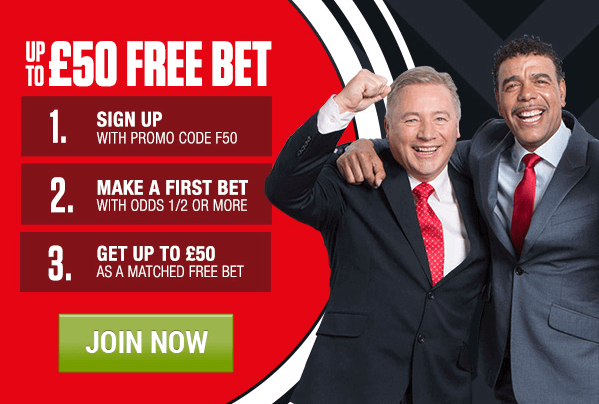 Ladbrokes offers new customers the chance to claim a free bets of up to £30 when they place their first bet. New customers simply need to register with Ladbrokes using the latest promotion code, deposit and place their first bet of £10. 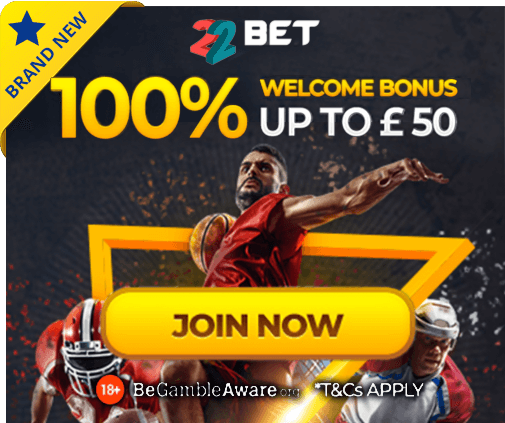 The deposit must be made in EURO or GBP and not using PaySafe, Skrill or Neteller and your first bet must be at minimum odds of 1/2 (1.5) to qualify, but provided you meet those conditions Ladbrokes will credited 3 x £10 free bets. Ladbrokes’ promotions are by no means limited to new customers. On all UK and Irish, horse racing punters can take advantage of enhanced best odds guaranteed. If they take a price on win or each-way and the starting price is greater, Ladbrokes pays not only at starting price, but ‘boost’ the price by a fraction as well. If, say, a punter backs a horse at 3/1, which subsequently wins at 7/2, Ladbrokes pays 4/1, up to a maximum of €200 or £200. Ladbrokes also offers daily price boosts on selected events, large and small, and for football punters the chance to have your money back as a free bet if one team in an accumulator of five teams or more, on selected matches, lets you down, up to a maximum stake of €25 or £25. Skrill are also available. So, too, are bank transfer, check, Entropay, UKash and Western Union. Officially, withdrawals by credit or debit card, or by bank transfer, take 3-5 business days to process, but Ladbrokes processes these transactions must faster than most other bookmakers. Ladbrokes is committed to ensuring that its website is safe, secure and resilient and employs Verisign Secure Sockets Layer (SSL) encryption for this purpose. If you have a question, Ladbrokes provides a comprehensive online help service, but you can also contact customer service directly, via online chat or telephone. Ladbrokes’ customer service does appear to be something of a ‘Marmite’ proposition, however; some people like it very much and some people dislike it equally strongly. From 679 reviews on Trustpilot, 61.9% gave Ladbrokes the maximum five stars, yet the company rates just 4.3/10, or ‘poor’, overall. Trustpilot isn’t the only place we’ve seen Ladbrokes’ customer service called into question but, in the absence of any first-hand evidence one way or another, we’d better leave you to make up your own mind on that score. All in all, it’s difficult to find much wrong with Ladbrokes, apart from reiterating that if you want to find the most competitive odds available on any event you’re probably better off looking elsewhere. Ladbrokes offers everything you might expect from a modern bookmaker but, at the same time, appears a little traditional, or ‘conservative’, when compared with some of the competition. You know you’re in safe hands with Ladbrokes, but don’t expect much to set your pulse racing. That said, two of the strongest brands in the sector have joined forces, so it’s entirely possible that Ladbrokes may set new standards for bookmaking in due course.